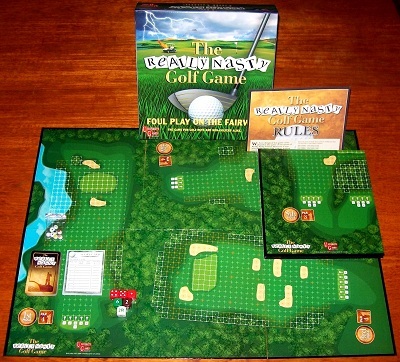 'THE REALLY NASTY GOLF GAME' BOARD GAME: Foul play on the fairway. From the makers of the cult classic: 'The Really Nasty Horse Racing Game'. Whether you are a golf nut or a complete notice, you will have a riot playing this game! The fairways are potential minefields of misfortune; misery can be heaped onto lofty opponents; and craftily played 'really nasty cards' can, for example, turn a fellow players perfect tee shot into a splash in the lake or a sumptuous drive up the fairway can see your opponent's ball mysteriously trampled in! The game is complete in and presents itself in excellent to mint condition. The game box is is clean and unscathed with each corned fully intact without any use of sellotape. Both game boards are in lovely, clean condition and all the cards and playing pieces are in excellent condition. The game comes with a very generous compliment of score cards.